Although this recipe serves two, you can easily double or triple it. 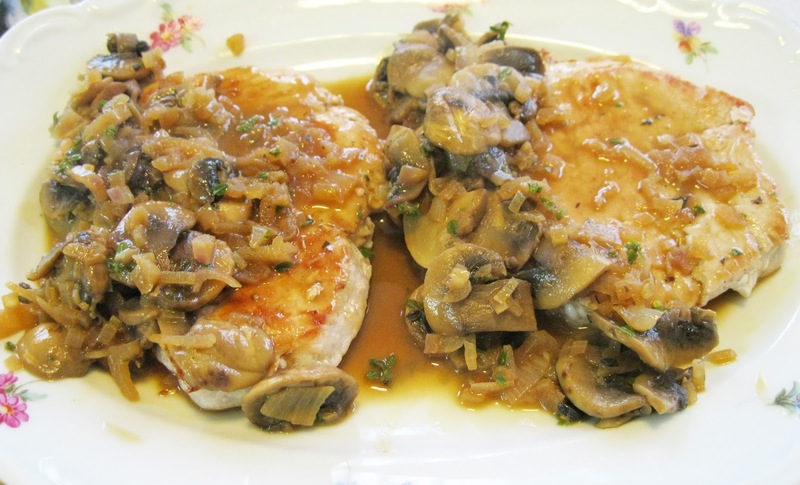 Your taste buds will love the nice change in these pork chops' flavor. Again, as with all the other recipes that have made their way to this blog, it's a keeper! 1. Sprinkle pork chops with salt and pepper. Coat a large nonstick skillet with cooking spray and place over medium heat. Add the pork chops and cook until browned on both sides and cooked through, 2 to 3 minutes per side. Transfer to 2 serving plates; tent with foil to keep warm. 2. Swirl oil into the pan, add shallot and cook, stirring until soft, about 30 seconds. Add mushrooms and cook, stirring occasionally, until they soften and begin to brown, about 2 minutes. Add vermouth and cook for 15 seconds. Stir in mustard, thyme and any juices that have accumulated from the pork; cook until the sauce is thickened and slightly reduced, 1 to 2 minutes more. Spoon the sauce over the pork chops and serve immediately. I put both chops in a large zip-lock bag and used a meat mallet to flatten them. The tip suggested putting the chops between two sheets of plastic wrap. Sorry, but too easy for the chop to go shooting out one side when you pound it - no matter how you try to seal the edges of the plastic wrap. I cooked the chops for an additional 2-3 minutes as the juices from the chops still ran pink instead of clear. I placed both chops on a serving platter so I only had the platter to tent with foil. Since I didn't have vermouth, I checked online as to what substitution I could use. White grape juice, dry white wine or as the recipe suggested unsweetened apple juice were recommended. I honestly do not know how this sauce was suppose to thicken as there was no dry ingredient added to absorb the liquid. I just continued to let the sauce simmer and reduce down.